As the New Year draws close, we at BNRC reflect on this poignant time. We wish Tad Ames all the very best and are grateful for his contributions to the Berkshire landscape. And we look forward to what lies ahead — charting the High Road with our county partners, protecting the most special places of our region, and welcoming BNRC’s new President. This seemed a good time to share Tad’s reflection on BNRC’s history, published on our 50th anniversary this year. All the best to you and yours, from all of us. The founders of Berkshire Natural Resources Council knew that doing nothing would be a sure way for the Berkshires to ruin its most valuable asset: Nature. So, led by Eagle publisher Don Miller, Crane & Co. executive Fred Crane, and founding president George Wislocki, they acted. Fifty years have passed, and if you haven’t given these leaders a silent prayer of thanks, now would be a good time. The organization started with a broad environmental scope that soon narrowed on conserving land and fighting the ideas (bypasses and mega-landfills, for instance) that would degrade the Berkshire landscape. In the 1990s, stewardship―building trails and caring for fields and forests―took its place on the front line. Today, we’ve boiled the mission down to one word: Landkeeping. So, what is the “greater glory”? Is it destination, or journey? My answer is definitive: Yes. In 1997, the Boston Globe published an article on feng shui and that old real-estate fundamental, location. 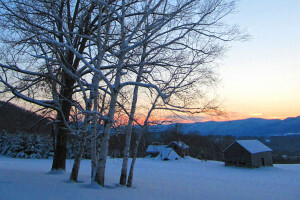 In passing, the piece alleged the existence of the Berkshire Energy Vortex, “an ethereal, feel-good energy field emanating from the mountains that has healing and spiritual powers that have drawn writers, musicians and artists for decades.” You may dismiss the supernatural, but can you deny there’s something in the Berkshire air? It’s been this way for centuries. Creative people and their patrons rub elbows with farmers and woodsmen. Healers and those in need of healing find new pathways here. We are not quite wilderness, yet neither are we entirely civilized. There’s a genuine cross-pollination of intellect and fashion at work in the Berkshires, abetted by transactional savvy. It’s our history, and it’s our future. And it all starts with our land. Surveys have shown that natural beauty is the primary motivator for tourist visits. And in a study completed by the Berkshire Taconic Community Foundation this summer, residents said that “protecting natural resources” was the second most important issue for improving lives in the region, behind jobs. These findings should surprise no one. “The Berkshires” as a concept, as an identifiable place―sorry, as a Brand―wouldn’t exist without our mellow, romantic and intimate landscape. Some say they would be just as happy if “the Berkshires” didn’t exist. The roads around Guido’s would certainly be less crowded. But without our land―or more academically, without our geography, that dynamic interaction of land and people― there is no Guido’s. There’s no Tanglewood, no Clark, no MoCA, no BIFF, no Pillow, no Naumkeag, no Canyon Ranch or Kripalu, no Red Lion, no High Road and maybe not even you … at least, not here. For land is where it all comes together. Land is the magnet that gathers and creates and sustains. Land feeds us, slakes our thirst and shelters us. Land is laboratory and workshop, muse and church, stimulus and balm. Land holds our memories, and, in its mute and nonjudgmental persistence, manifests our faith that the sun, indeed, will come up tomorrow. Bowhunters and birdwatchers alike find something to love in the woods. If, for a few moments, they set aside their small differences and imagine themselves in the other’s shoes, they see how lucky they are to have this place to share, and how much each has to lose if we squander our inheritance. In this age of data and benchmarks, it’s hard to resist numbers. BNRC turns 50 this year. We care for 21,260 acres and 50 miles of trails. We take care of 97 properties. You’re welcome to visit any time. More than numbers, though, I prefer to think of my friend Gige, who still walks to the flat rock on Lenox Mountain where he ate sandwiches with his hunting companions 75 years ago. I cherish the joy Connie feels when she writes to me about the days she has spent taking her “three kids and six grandkids and now two great-grands” to waterfalls and blueberry patches that her mother showed her a lifetime ago. I point to the pleasure Andrea takes in walking the Hoosac Range Trail, sensing, as she goes, that the path is a story, told turn by turn. Maybe you’re on the Tanglewood lawn when it happens. Maybe you’re leaving work. You might be fishing, or maybe you’re in your boyfriend’s backyard. A bird flies overhead, dark against the sky. You remember the time the bear came by. It occurs to you to take a picture, to find the right words, to hold this moment, to share it with someone you love … to try to say what it’s like to feel the world turning around your heart. This is the Berkshires. Glory be.